I greet you today, dearest Brothers and Sisters in Christ, with joy overflowing in my heart…as we celebrate the great feast of Pentecost! We have spent these last 50 days celebrating our Lord’s resurrection, His Ascension into heaven…and now we climax that entire season with this incredible celebration of the decent of the Holy Spirit. Last week, my family and I went on retreat to St. Tikhon’s monastery, which is the oldest Orthodox Monastery in the country. This community is located in the middle of the Pocono mountains…where the nearest Walmart is 45 minutes away…and you really have to crave fast food to eat it, because the nearest McDonalds is just about the same distance! Cell phone service is spotty at best, especially as you ascend the winding roads ,away from all of the noise of the world…and into the peace and serenity of the grounds where Saints have walked. Every time I begin that ascent from the city, full of the hustle and bustle of life, up into the quiet and peaceful mountains…I feel as if I am entering into an alternate reality. The pavement and street signs turn into dirt roads and trees. The car horns and exhaust are transformed in the distant ringing of bells and the smell of incense. The noise of the world slowly decreases…and the sound of the Divine Liturgy increases. With limited cell service, all thoughts and worries of the world can easily slip away, making it easier to enter into the spiritual life that was all made possible by the feast day we celebrate today…the descent of the Holy Spirit at Pentecost. Dearest Brothers and Sisters in Christ, the world which we live in is seeking a change. All of humanity, whether they can see it or not, is yearning for this type of peace…this alternate reality. Each and every one of us, especially when our lives are undergoing some sort of trial or difficulty as a result of the fallen world, seeks that love and comfort that our Lord offers. We seek that alternate form of existence where we are never sad, where there are never tragedies, where war doesn’t exist, where there is no racism, and where there is no death. Humanity was made to crave a life surrounded by the Holy Spirit…a life that St. Paul describes as one of peace, righteousness, and joy. That, my dear flock…is what we have been promised for these last 50 days, and it is exactly what we receive and celebrate today! How perfect, that on the very day that our lives are transformed by the Spirit, that we witness a personal Resurrection and Pentecost for three new warriors of Christ. As Justin, Stephen, and Christina had learned in our Orthodoxy 101 courses, they are now entering into this alternate reality…this new form of existence. Baptism and Chrismation for the ancient Church isn’t just about proclaiming your loyalty to Christ and accepting Him as your Lord and Savior. It is the process of DYING to an old way of life…and RESSURECTING into a new life. How often, dearest brothers and sisters in Christ, do we forget that many of us, at some point in our journey into Orthodoxy, underwent this same transformation…and entered into a new existence. 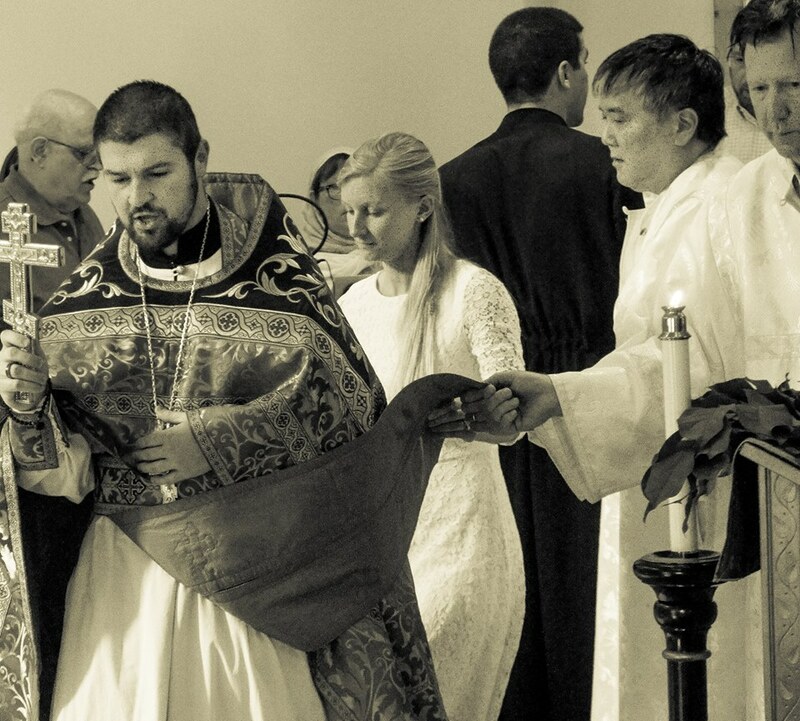 It is a huge temptation, after we leave the confines of the Church, to become lax in our new lives….allowing ourselves to dirty our white baptismal garments with the filth of the world. We forget our calling…and so often fall backwards into a flawed way of life. The question brought before us this morning, is how do we get that zeal back? Or, in the case of Justin, Stephen, and Christina, how do I keep the fire of the Holy Spirit from dissipating? What does this blessed life offer me, that I cannot get in the midst of the world outside of these four walls? To answer these questions, we need but only open our eyes and turn our gaze to those men and women who have experienced what a life with the Holy Spirit is all about. We need only turn our gaze to the icons that are behind me. Each and every one of the saints depicted, had their lives transformed into something wonderful. Their love of God was so great, that it flowed from them, and touched the lives of everyone they came into contact with…healing diseases, and fixing fallen souls. The knowledge and power of the Holy Spirit allowed them to overcome difficulties in life that many of us could not fathom of, even in our nightmares. They were able to do all of this because they spent every waking moment of their lives, keeping the fire of God burning in their hearts. “How do we get the Holy Spirit to continue to transform our lives, day after day? The answer is simple….we ask Him! Right after the Divine Liturgy of Pentecost today, we will, for the first time in 50 days, fall to our knees and ask God for the same experience of the Holy Spirit, that Justin, Stephen, and Christina received just a few moments ago. It is then, and only then, that we can continue to transform not only our lives, but the world around us…from racism to acceptance…from war to peace…and from death…to life, amen.